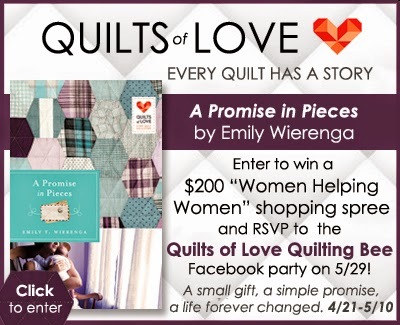 Laurie Here - Contemporary Fiction and MORE - Book Reviews: "A Promise in Pieces" A Quilts of Love - Every Quilt Has a Story series by Emily T Wierenga/#Giveaway/Facebook Party! 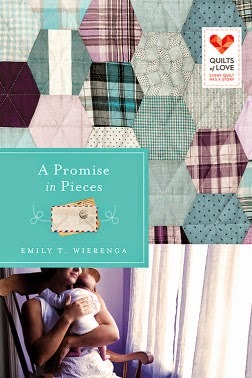 "A Promise in Pieces" A Quilts of Love - Every Quilt Has a Story series by Emily T Wierenga/#Giveaway/Facebook Party! This happens to be my first time reading 'A Quilts of Love' novel, and won't be my last! Now I want to read them all! This book happens to be one of over twenty in this series of stand alone novels, and this is also author Emily T Wierenga's debut novel! Congratulations to her! I definitely plan on reading many more of her books in addition to the other authors in this series, too. I really enjoyed this author's writing style and her story telling because it felt 'real', as if I was right there in the car listening to the story! This book covered so much in the 207 pages, but it never felt as if it was too much. Now that I am finished, I am finding myself thinking more about this book, still! I thought the story this book told was pretty amazing! It was a beautiful story for everything Clara, our main character, did! Even though her husband may be quiet, Clara's growing up life was not quiet to begin with at all. This book starts out in the year 2000 with Clara and her entire family going on a trip to Louisiana for a very important mission. She had a quilt to deliver to the National World War II Museum to be accepted as an artifact. This quilt helped to deliver many babies into this world and to comfort many women who lost husbands or sons/grandsons from the war. For all of the lives this quilt touched, their names were all hand stitched onto this quilt, so there is a lot of history on/in it. It was never intended to be, it just happened to turn out this way. In the beginning of this trip, Clara's grandson, Noah, was playing a game on one of those electrical devices, a Nintendo, and when he handed it to her to try to play it, it wrenched her heart to see he was playing a game in which you shot and killed other people. If only these young kids had known life/war was not a game but a true loss of life affecting so many people. This gave Clara the idea to ask her family if they would like to hear her life story on this trip. She asked if any of them were interested, and they were! (Even the Nintendo game disappeared!) This is where the book starts to flip-flop back and forth between the present and the years of WWII. On page 57, Clara tells her grandson, "If it weren't for Mattie, I would never have found my way to your father nor to each of you. So in a way, this trip is about commemorating the gift of friendship. The gift of family. The gifts of faith. And it all started with a quilt." It is in the second chapter the story that starts to tell us how Clara's life begins. We go back to the year 1943. We learn Clara was named after Clara Barton, the founder of the National Red Cross, also her Grandmother! Clara had the same drive and ambitions as her grandmother had, and every different part of her life was devoted to God's plan he had for her to follow from the beginning of her life well into her 80's, and just shortly after the loss of her husband. God was once again at work inside of Clara, and she knew it! Clara starts telling us the story of her life when she and her only friend at the time, Eva, go to the Red Cross Recruiting Center and signed up with the Army Nurse Corps. This was BIG and wrong according to Clara's parents, but right for Clara to do. Clara had many hurdles to get through in life, starting in her childhood. One of her very first was her bible thumping preacher father who seemed to use the bible the way he wanted to as it pertained to him and his circumstances no matter who it seemed to hurt, and it hurt Clara the most as she had to listen to him twist it to serve his wants and needs. Her mother was not one to stand up to her father, either. She was not allowed to play with other kids her own age either, but as long as her life revolved around the church, then it was okay. This was not okay, and Clara missed out on a lot of childhood because of it. Not only that, but her father was completely against the war and thought we should just turn the other cheek! What? How anyone could be against that war is beyond me! He not only preached it but lived what he preached. It was during this time that Clara had lost her faith in God because of her father. She was not even allowed to read any other book besides the bible. As we read this book, we learn she finds her faith again, but it took quite a lot to get it back. Clara was so afraid of telling her parents what she did, she waited until the night before she was to leave to go the next morning, yet she lies and tells them she has a week yet before she really has to leave. Lying to them was the only way she was going to be able to go. Later that night Eva threw a stone which hit her window, and out of it down she climbed to go start her life. Now they were on a ship on their way to Normandy, France where they ended up nursing 'all' of the good troops injuries the Germans inflicted upon them. Clara made many friends along her time in Normandy, France, and many of them lifelong friends, especially Mettie. There is so much more to learn from and about Clara's during her time in France during the war, but that is left for you to read and enjoy! It wasn't until later after she returned home that she met a man named Oliver who was smitten over her. The problem was she had decided marriage was not in her future. See how the plans God has for us can change despite what 'we' want for ourselves! That was enjoyable! A little shocking because I truly believed her! Another quote from the book: "Oliver was a very quiet man who loved the Lord (and his wife and family) with a LOUD kind of love." That was the perfect description of Oliver. To read of their awkward yet amusing courtship was very amusing! This is one book I HIGHLY recommend anyone read. It touched my heart and is a book you will not soon forget. This book is very full of faith (it must be especially when you are sitting in the center of a world war! If that does not test your faith, I don't know what will?! ), quiet love, shows us the how God uses us for His plans and not ours, and great family. I just want to add a personal note. I was lucky enough to have both sets of my grandparents alive well into my early 20's! I was extremely grateful! I heard so many WWII stories from all of them. Being an avid family tree maker and scrapbooker, I sucked in every story they ever told me about WWII, and I asked a lot of questions, too. They also taught me a lot about the Depression prior to the war, too (although that is 'not' in this book.) I also have scrapbooks I made that have the war ration books in them. I could SO relate to one of the characters in this book because one of my own grandmothers did what one of the characters in this book did! They did not use all their ration stamps and getting so low without food in the house that she would get left with ONE packet of sugar, too! I had a good laugh when I read that! She never would use all the stamps up each month, either, which drove my own mother and her two brothers crazy! They were hungry! I can honestly say what this author writes IS true and does follow true to history of what I was told from word of mouth by the people who lived through that time. This book will always hold a dear spot in my heart because I felt like my grandparents were back with me, even if for a little while! Thank you, Emily T Wierenga! I received this book for FREE from Abingdon Press and LitFuse Publicity in exchange to read and write a review about it. It is NOT required for this review to be either positive or negative, but of my own honest opinion. "Free" means I was provided with ZERO MONIES to read this book nor to write this review, but to enjoy the pure pleasure of reading it. I am disclosing this information in accordance with the Federal Trade Commission's 16 CFR, Part 255, http://www.access.gpo.gov/nara/cfr/waisidx_03/16cfr255_03.html Guides Concerning the Use of Endorsements and Testimonials in Advertising. Emily is celebrating the release of her debut novel with a “Women Helping Women” shopping spree giveaway. Enter today by clicking one of the icons below. But hurry, the giveaway ends on May 10th. Winner will be announced on theQuilts of Love blog on May 12th. Then be sure to stop by the Quilts of Love Facebook page on May 29th for the “Quilting Bee” Facebook party with Emily and other Quilts of Love authors. RSVPfor an evening of book chat, quilting tips and tricks, prizes, and more! 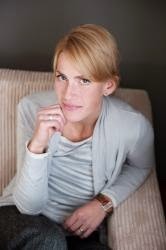 Find out more about Emily athttp://www.emilywierenga.com.